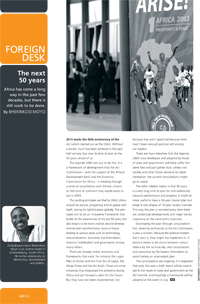 Africa has come a long way in the past few decades, but there is still work to be done. More and more organisations are opening their hearts and wallets to aid communities in need, but are they approaching it in the right way? Can elections be	influenced by the subtle use of software? 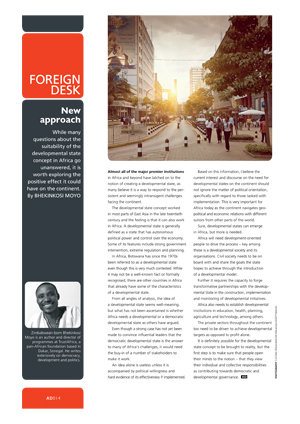 While many questions about the suitability of the developmental state concept in Africa go unanswered, it is worth exploring the positive effect it could have on the continent. 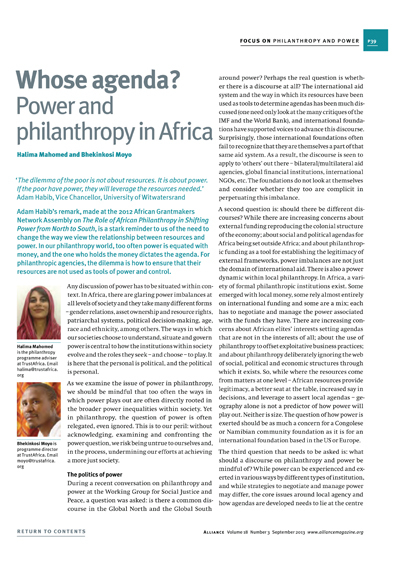 Halima Mahomed and Bhekinkosi Moyo (2013), Alliance Magazine, September 2013. Moyo, B (2011), African Decisions, Issue 2. Moyo, B (2010) ‘’. African Decisions, Issue 1. Moyo, B (2010) in African Decisions, Issue 2. Moyo, B (2010) in African Decisions, Issue 3. 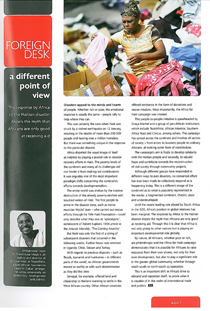 Moyo, B (2009) in African Decisions, Issue 3. Moyo, B (2009) in African Decisions, Issue 4. 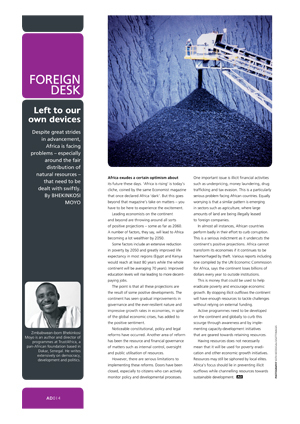 Moyo, B (2013) ‘Left to our own devices’ in African Decisions, Issue 1. 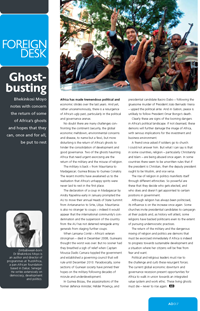 Moyo, B (2012) ‘Hot and Bothered’ in African Decisions, Issue 1. Moyo, B (2012) ‘The basic truth’ in African Decisions, Issue 2. Moyo, B (2012) ‘Creative Juices’ in African Decisions, Issue 3. Moyo, B (2011) ‘Social Justice Revisited: influencing policy at a pan African level’. 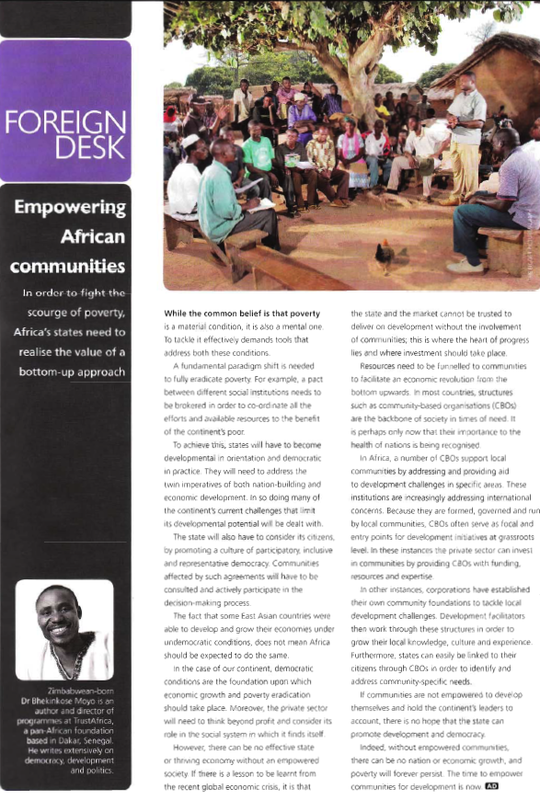 Pambazuka, Issue 512. 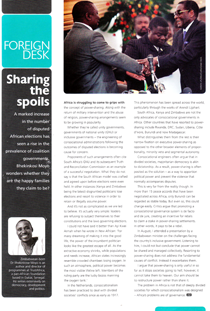 Moyo, B (2011) ‘All the right moves’ in African Decisions, Issue 1. 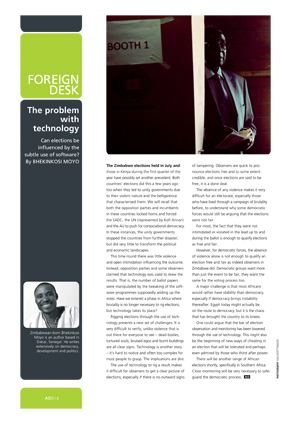 Moyo, B (2011) ‘Age old question’ in African Decisions, Issue 3. 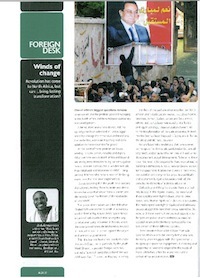 Moyo, B (2011) ‘Uncertain Times@ in African Decisions, Issue 4. 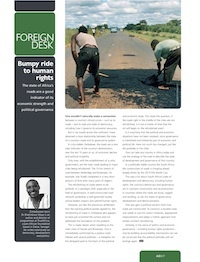 Moyo, B (2010) ‘Public governance under attack’ in African Decisions, Issue 4. 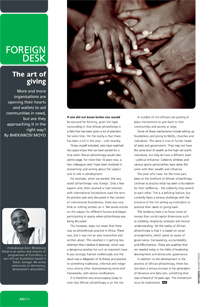 Moyo, B (2008) ‘Can the New African Foundations Level the Playing Field’ in Alliance, September. Moyo B & Maloka E (2005a) ‘Walking a tightrope: SA, Africa and the UN’, FOCUS,Issue 40, 4th Quarter, 2005, HSF, pp.30-32. Moyo, B (2005) ‘UN reform and Global Social Movements: towards a sustainable cooperation’ Inside AISA, august-September. Moyo, B (2005) ‘Paul Wolfowitz at the World Bank: Implications for poverty reduction in Africa’, Inside AISA, Pretoria, May. Moyo, B (2004) ‘Maintenance Law puts Children first’, Amalungelo, 10 Years of HERSTORY, Gender Links, April. Moyo, B (2004) ‘Zimbabwe Needs a Protest Movement’, City Press. Moyo, B (2004) ‘What About Us’? Mail and Guardian, 30 July. Moyo, B (2003a) ‘Civil Society Participation in Nepad’, OD Debate, Vol.10 No. 2, September. Moyo, B (2003b) ‘Maintenance: Do the right thing’, Amalungelo, Volume, 1. August-September.